Draft: 2006, Florida Marlins, 5th rd. David Christopher Hatcher…resides in La Grange, NC, with his wife, Jenny, and son, Jensen… graduated from Kinston High School (NC) in 2003 and played college ball at the University of North Carolina-Wilmington…selected by the Marlins in the fifth round of the 2006 First-Year Player Draft. Began the season with the Los Angeles Dodgers and was 0-1 with a 4.66 ERA in 26 relief appearances when he was traded to Oakland Aug. 15…went 1-1 with a save and a 3.52 ERA in 23 games with the A's and combined for a 1-2 record and a 4.22 ERA in 49 appearances in his seventh season in the majors…had career highs in strikeouts (63), innings pitched (59.2), hits (58), runs (29), earned runs (28) and home runs (10) and matched his high in walks (21)…his 49 games pitched were three short of his high of 52 in 2014 with Miami…allowed a .250 opponents batting average, including .213 (19-for-89) against left-handed hitters compared to .273 (39-for-143) against right-handers…yielded a .125 batting average with runners in scoring position but opponents hit .309 when leading off an inning…first batters faced hit .239 and he walked just two for a .265 on-base percentage…allowed 3-of-14 (21.4%) inherited runners to score…stranded all seven of his inherited runners with the Dodgers…had a 2.45 ERA in the Coliseum, a 3.15 ERA in Dodger Stadium and a 5.65 ERA in all other ballparks…now has a 3.20 ERA (38 er in 107.0 ip) in 101 career outings in his home ballparks compared to 5.83 (79 er in 122.0 ip) in 115 games on the road… logged a 2.45 ERA in 11 outings on no days rest, a 4.62 ERA in his other 38 appearances…tossed at least one inning in 40 of his 49 appearances, including two or more 13 times…his teams were 32-17 (.653) in his appearances, including 16-7 (.696) with the A's. MAJORS: Was on the Dodgers Opening Day roster…struck out a career-high tying five batters April 17 against Arizona (also June 13, 2014 vs. Pittsburgh and June 2, 2016 at Chicago-NL)…also had season-highs in innings pitched (2.2) and hits (4) in that game…allowed a season-high three runs April 22 at Arizona (also June 3 at Milwaukee and June 13 at Cleveland)…finished April with a 3.95 ERA in eight games and then logged a 3.14 ERA in 11 appearances in May…struck out 17 and walked just one in 14.1 May innings…had a 3.33 ERA over his first 18 games through May 29…then allowed nine runs on nine hits and seven walks in 9.2 innings over his next eight games from May 30 to June 22 (8.38 ERA)…issued a career-high tying three walks June 3 at Milwaukee (third time)…was placed on the 10-day disabled list June 23 with thoracic inflammation…began a rehab assignment with the Dodgers affiliate in the Arizona Rookie League July 29 and made two appearances there and three with Triple-A Oklahoma City from Aug. 4 to 9…had made five rehab appearances (6.0 ip, 4 h, 1 r, 1 er, 1 bb, 9 so) when he was reinstated from the DL Aug. 13…did not pitch before he was traded to Oakland Aug. 15 for international slot money…reported to Oakland the next day and did not allow a run in his first three appearances (3.1 ip)…then allowed at least one run in four of his next six games from Aug. 22 to Sept. 2 (9.64 ERA)…including one run on three hits in 0.1 innings in his 200th career appearance Aug. 27 against Texas…had a career-high 12.0-inning scoreless streak over an 11-game stretch from Sept. 4 to 23…allowed just six hits (.146 opponents batting average) and walked four while striking out eight…was credited with his only save of the season Sept. 6 against Los Angeles (AL) when he retired the side in order in the ninth inning of the A's 3-1 win…that began a season-ending stretch where each of his 12 appearances came in A's wins…finished September with a 1.80 ERA in 14 appearances. Appeared in 37 games, going 5-4 with a 5.53 ERA (25 ER/ 40.2 IP), before being placed on the DL on July 20, where he remained for the duration of the season with a strained left oblique...Collected his first Major League hit and RBI on June 18 against the Brewers, driving in a run with an RBI single in the third inning. Spent majority of season with Triple-A New Orleans, posting 4-3 record and 3.61 ERA (67.1 IP/27 ER) in 60 appearances. Had two stints with Miami, going 0-1 with 12.46 ERA (8.2/12)...Led all organizational relievers with 33 saves, while also taking top spot in Pacific Coast League rankings...Tied PCL single-season saves record, last done by Ryan Speier in 2007, while also setting Marlins' Triple-A record...Earned PCL Midseason and Postseason All-Star honors...Did not allow more than one run in any of first 45 outings...Surrendered two or more runs in three of next five outings following season-opening stretch...Recorded a season-high four strikeouts on May 4 at Albuquerque...Successfully converted first seven save opportunities before blowing save on April 25 at Oklahoma City...Went on to convert next 20 opportunities from April 29-July 14...Tossed season-high 3.0 innings on May 10 vs. Salt Lake City, allowing one run on three hits...Also, had six outings span 2.0 innings...Recalled for first time on July 7; lone appearance during stint was against Atlanta on July 8 at Marlins Park. Was optioned back to NOLA following outing...Recalled for second time on September 1, and made six appearances over remainder of season...Tied career high with 2.0 innings pitched in second game of Sept. 14 doubleheader at Citi Field...Tossed 2.0 innings in next appearance, Sept. 16 at Philadelphia...Allowed career-high four runs in outing, while tying career best with three strikeouts. Split season between Triple-A New Orleans and Miami. With Zephyrs, was 1-0 witha 0.77 ERA (47.0 IP/4 ER) and 11 saves in 37 games. Appeared in 11 games withMarlins, owning no record and a 4.30 ERA (14.2/7). In New Orleans, all four earned runs came in his first 13 appearances. Allowed justone unearned run over his final 24 games (31.1 IP). Finished Triple-A season with 15.2scoreless innings over 12 games. With New Orleans, did not walk more than two batters in a single outing, reachingtwo on May 23 at Reno, June 3 at Nashville and July 6 vs. Oklahoma City. Recorded a season-high five strikeouts on June 23 vs. Memphis. Owned lowest ERA among Triple-A relievers with at least 30 appearances. Made season debut on June 17 at Tampa Bay, tossing 1.0 inning. Surrendered a season-high four runs in his second appearance, June 20 at Boston.Proceeded to finish season by allowing just three earned runs over final nine games(2.25 ERA). Tossed career-best 2.0 innings on August 3 at Washington, allowing one hit whilewalking two. Equaled high on August 8 at Mets, August 20 at Arizona and August25 at Dodgers. Had two stints with Florida. Was first recalled on July 8 and optioned on July 17. MadeMajor League debut as a pitcher on July 16 at Chicago-NL, becoming first playersince Art Doll of Boston Braves in 1935 to play first ML season as a catcher and returnin a subsequent season as a pitcher (Elias Sports Bureau)...Recalled by Marlins on August 18 and finished season in bullpen, making 10 appearanceswith a 7.71 ERA (9.1 IP/8 ER). Tossed a career-best 1.1 innings on September 9at Pittsburgh, allowing just one hit while recording one strikeout...Led Jacksonville in ERA and average against (.192), ranked second in strikeoutsamong relievers (57) and ranked third in appearances, garnering Southern LeagueAll-Star honors...Began first full season as a pitcher by tossing scoreless ball in first seven games (8.2innings) before surrendering first run on April 28 at Montgomery...Converted first career save on June 3 vs. Carolina (third opportunity), with 1.0 scorelessinning...First win of year came on June 23 at Chattanooga, tossing a perfect inning with twostrikeouts. Made stops in Jacksonville and New Orleans before making it to Florida in September. WithJacksonville, hit .202 with three home runs and 26 RBI in 84 games. In 17 games with New Orleans,had a .167 average with two home runs and 10 RBI ... Between Jacksonville and New Orleans, set career-highs in assists (90) and double-plays (8) ... Collected a season-high three hits on May 21 at Tennessee, including a home run. Knocked ina season-high five RBI in the contest. Also had three hits on the final day of the season, August31 vs. Tennessee ... Made his second career pitching appearance on June 14 vs. Mobile. Earned the win after tossing1.0 perfect inning. Used 13 pitches to get through the frame and tallied one strikeout ... Had only two hits in 28 postseason at-bats, but none bigger than his ninth-inning walkoff homerun to make the Suns Southern League champions in Game 4 of the Southern League Championship Series vs. Tennessee ... Recalled by Florida on September 19 and made his Major League debut that night vs. Chicago ... Made his first career start on September 26 at Milwaukee. Finished the night 0x2 with a walk and a strikeout. Started the season with single-A Jupiter, appearing in only six games with the Hammerheads before being promoted to double-AJacksonville. With Jupiter, hit .333 with a double and two RBI...Promoted to Jacksonville on April 28 and finished the season with a .218 average, eight home runs and 27 RBI in 51 games with theSuns...Recorded a season-high three RBI on May 13 at Mississippi...Connected for two home runs on June 5 vs. Carolina...Made his first career pitching appearance on May 1 vs. Mobile, retiring the only batter he faced...Finished the season by collecting at least one hit in a season-best seven consecutive games, batting .342 (9x26) with two doublesand five RBI. Following the 2008 season, played for the West Oahu CaneFires in the Hawaii Winter Baseball league, posting a .283 average(15x53) with three home runs and 12 RBI in 17 games. Played entire season with Greensboro (A), hitting .242 with 15 home runs and 50 RBI in 102 games... had two multi-homer games...went 3x5 with two solo homers July 13 at Lexington, then was 2x3 with two home runs and three RBI August 23 vs. Hickory... had sea-son-high five RBI (3x5, HR) June 24 vs. Augusta...Appeared defensively at catcher (96), outfield (3) and first base (2)... led South Atlantic League catchers at throwing out runners,catching them at a 45.3% (53 of 117) clip... was 2x6 with home run and two RBI as designated hitter... went 0x3 as pinch-hitter. Appeared in 36 games with Jamestown (A), after he was selected by Marlins in Draft... batted .181 with two home runs and 17 RBI... threw out 14 of 34 (41.2%) of base runners. October 15, 2018 RHP Chris Hatcher elected free agency. October 15, 2018 Oakland Athletics sent RHP Chris Hatcher outright to Las Vegas 51s. September 1, 2018 Oakland Athletics selected the contract of RHP Chris Hatcher from Nashville Sounds. 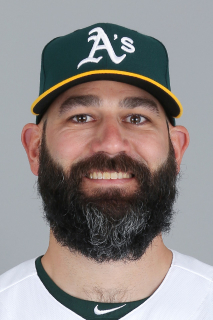 August 12, 2018 Oakland Athletics sent RHP Chris Hatcher outright to Nashville Sounds. August 10, 2018 Oakland Athletics designated RHP Chris Hatcher for assignment. August 16, 2017 Oakland Athletics activated RHP Chris Hatcher. August 15, 2017 Los Angeles Dodgers traded RHP Chris Hatcher to Oakland Athletics for Future Considerations. August 13, 2017 Los Angeles Dodgers activated RHP Chris Hatcher from the 10-day disabled list. August 4, 2017 Los Angeles Dodgers sent RHP Chris Hatcher on a rehab assignment to Oklahoma City Dodgers. July 29, 2017 Los Angeles Dodgers sent RHP Chris Hatcher on a rehab assignment to AZL Dodgers. June 23, 2017 Los Angeles Dodgers placed RHP Chris Hatcher on the 10-day disabled list. Thoracic inflammation. November 7, 2016 Los Angeles Dodgers activated RHP Chris Hatcher from the 60-day disabled list. July 21, 2016 Los Angeles Dodgers transferred RHP Chris Hatcher from the 15-day disabled list to the 60-day disabled list. Severe left oblique strain. April 15, 2016 Los Angeles Dodgers activated RHP Chris Hatcher from the paternity list. April 15, 2016 Los Angeles Dodgers placed RHP Chris Hatcher on the 15-day disabled list. April 14, 2016 Los Angeles Dodgers placed RHP Chris Hatcher on the paternity list. August 14, 2015 Los Angeles Dodgers activated RHP Chris Hatcher from the 60-day disabled list. August 3, 2015 Los Angeles Dodgers sent RHP Chris Hatcher on a rehab assignment to Oklahoma City Dodgers. July 24, 2015 Los Angeles Dodgers sent RHP Chris Hatcher on a rehab assignment to Rancho Cucamonga Quakes. May 22, 2014 Miami Marlins selected the contract of RHP Chris Hatcher from New Orleans Zephyrs. February 15, 2014 Miami Marlins sent RHP Chris Hatcher outright to New Orleans Zephyrs. February 11, 2014 Miami Marlins designated Chris Hatcher for assignment. September 1, 2013 Miami Marlins recalled RHP Chris Hatcher from New Orleans Zephyrs. July 9, 2013 Miami Marlins optioned Chris Hatcher to New Orleans Zephyrs. July 7, 2013 Miami Marlins recalled Chris Hatcher from New Orleans Zephyrs. March 13, 2013 Miami Marlins optioned Chris Hatcher to New Orleans Zephyrs. August 3, 2012 Miami Marlins recalled Chris Hatcher from New Orleans Zephyrs. June 21, 2012 Miami Marlins optioned Chris Hatcher to New Orleans Zephyrs. June 16, 2012 Miami Marlins recalled Chris Hatcher from New Orleans Zephyrs. May 10, 2012 Miami Marlins optioned Chris Hatcher to New Orleans Zephyrs. May 5, 2012 Miami Marlins recalled Chris Hatcher from New Orleans Zephyrs. March 15, 2012 Miami Marlins optioned Chris Hatcher to New Orleans Zephyrs. August 18, 2011 Florida Marlins recalled Chris Hatcher from Jacksonville Suns. July 18, 2011 Florida Marlins optioned Chris Hatcher to Jacksonville Suns. July 8, 2011 Florida Marlins recalled Chris Hatcher from Jacksonville Suns. March 11, 2011 Florida Marlins optioned Chris Hatcher to Jacksonville Suns. September 19, 2010 Florida Marlins recalled Chris Hatcher from Jacksonville Suns. September 8, 2010 Florida Marlins optioned Chris Hatcher to Jacksonville Suns. September 1, 2010 Florida Marlins selected the contract of Chris Hatcher from Jacksonville Suns. August 31, 2010 C Chris Hatcher assigned to Jacksonville Suns from New Orleans Zephyrs. August 20, 2010 Chris Hatcher assigned to New Orleans Zephyrs from Jacksonville Suns. August 5, 2010 Chris Hatcher assigned to Jacksonville Suns from New Orleans Zephyrs. July 21, 2010 Chris Hatcher assigned to New Orleans Zephyrs from Jacksonville Suns. February 8, 2010 Florida Marlins invited non-roster C Chris Hatcher to spring training. April 28, 2009 Chris Hatcher assigned to Jacksonville Suns from Jupiter Hammerheads.